Living life is perhaps the hardest challenge of them all as it comes with challenges that must be faced on a daily basis. You may appear to be feeling like you’re the only person in the world facing such hardship, but, you’re not alone. No matter how difficult the challenge, there is not one single person living on this world that isn’t dealing with something. Dru Babcock is no exception. Our professional business coach "Dru", like many others, has been in that dark place where hope, that one glimmer of light, seems impossible to reach. This was his life. It had no meaning. It had no direction. That was when he decided enough was enough and created an entirely new life with meaning beyond anything he ever had before. What did Dru do? He became a professional business coach. Why? Because he found that his passion for helping others succeed is both extremely rewarding and satisfying. Here’s a quote from Dru that he hopes will inspire you to dig deep and make big changes that will positively affect your life. 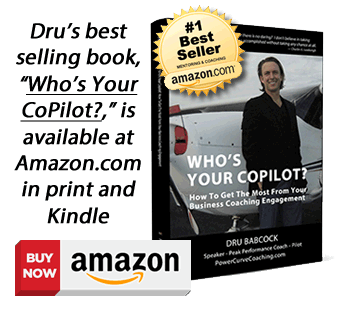 Dru Babcock is a seasoned business owner, best selling author, speaker and professional pilot. He spent the majority of his time trying new things and making mistakes. But somewhere along the way he developed a passion for people and helping them to achieve something greater than themselves. He has continuously looked for other opportunities to further his knowledge in the area of personal development coaching and has been successfully providing these services for several years. He has trained and undergone personal development with the Anthony Robbins Company (RRI) and earned his coaching certification through the Coaches Training Institute (CTI). Dru is your test pilot. Through his successes and past mistakes in business Dru has developed the navigational approaches necessary to help you achive your goals exponentially. 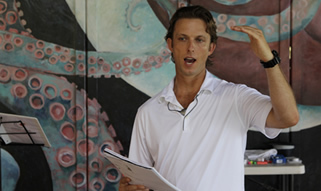 Dru is a Certified Professional Co-Active Coach (CPCC), recognized by the International Coaches Federation (ICF). RRI and CTI are both proven models, which work synergistically for your benefit. Having graduated from Anthony Robbin’s Mastery University, Leadership Academy and Business Mastery programs, he holds a bachelor’s degree in Business with an emphasis in Marketing from the University of San Francisco. Further, he has served as President of the American Marketing Association (collegiate chapter) while there. If you’re interested in growing as an individual and or you are seeking enlightenment in the field of business, please call us for a free discovery session so that we can help get you started.